This board shifts the signalling levels of an I2C bus. 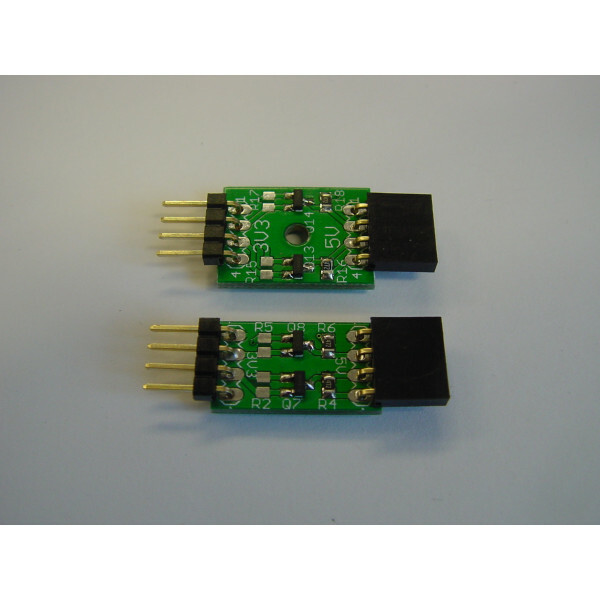 This enables you to hook up 3V3 I2C slaves to an 5V I2C master, or the other way around. The I2C master side doesn't have pull-ups, so that you can integrate the board into an existing application, without modifications. The slave side does have pull-ups. I2C requires a pullup on the bus. "master" devices like the raspberry pi have those integrated on their PCB, so we recommend not requesting a pullup on the 3.3V side if you are going to use your level shifter with the raspberry pi. The levelshifter is not by definition restricted to 5V and 3.3V. There is, however, a "higher voltage" and a "lower voltage" side. The "higer voltage" side is marked "5V" on the PCB, and the "lower voltage" side is marked 3.3V. But the board equally well allows a level conversion from 5V to 3.0V, or from 3.3V to 2.7V. But in this last case it might be confusing that you have to connect the 3.3V bus to the PCB on the side marked "5V". Keep the higher voltage and the lower voltage the right way around! Connectors (4Pin Right-angle male and female) come supplied, but not pre-soldered.